The Ulysse Nardin Skeleton timepiece is a transparent beauty, where the inner workings become the art form. It shares its fluid network of positive and negative space intertwined ever so delicately with its wearer. The seemingly infinite maze of individual movements, parts and bridges are reduced to essential composition and masterfully reinterpreted into a rare piece of work. 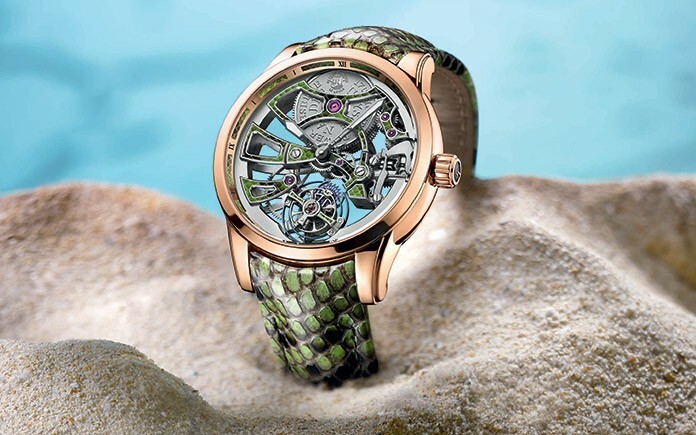 The Royal Python Skeleton Tourbillon takes the beautiful complexity of its predecessor to an entirely new level. Natural, free-flowing light passes through the timepiece, creating radiant luminosity. Silicium technology and an in-house-developed flying tourbillon honor the mechanics of the collection, featuring a silicium balance spring, anchor and escapement wheel. Hand-painted movement bridges dotted with rubies reveals the skill and sensibility of the artist, while exhibiting the wondrous world of Ulysse Nardin’s métiers d’art. 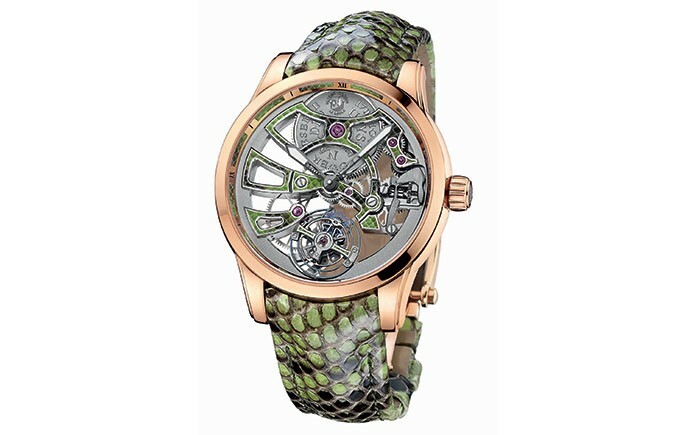 A python strap finishes the snakeskin-inspired aesthetic of the entire timepiece. Lush like the jungle, this “call of the wild” timekeeper is as original in style as it is in makeup. A limited edition of 18 pieces in rose gold 4N, the Royal Python Skeleton Tourbillon presents a fearless character intended for the uninhibited at heart.